I’ve realised that I probably don’t need as much coverage as I convince myself I do so I’ve been trying and loving sheer foundations and tinted moisturisers lately. 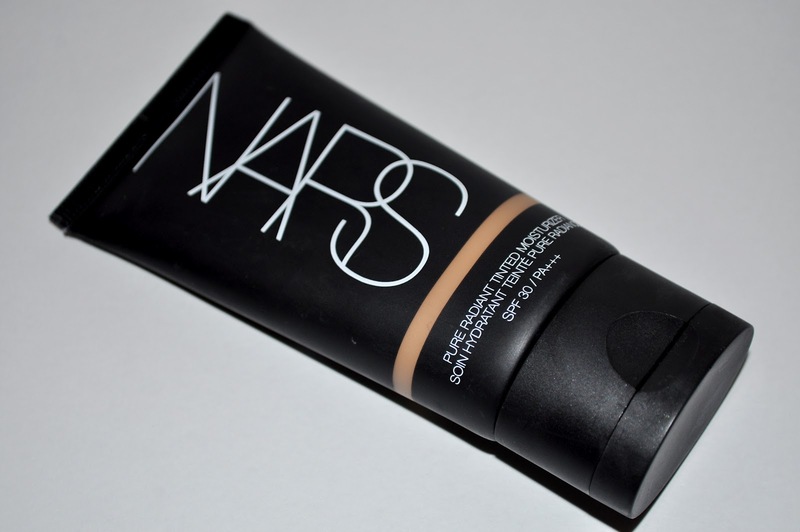 That’s why, as soon as I saw the promo image above, I knew I had to try NARS new Pure Radiant Tinted Moisturiser. “Your skin – almost bare, but better. This advanced, oil-free formula provides a translucent veil of color and sun protection while helping to reduce the appearance of hyperpigmentation and dark spots in just four weeks. Infused with lush, naturally derived botanicals and ingredients to immediately helps thirsty skin feel hydrated. Kopara from French Polynesia and mineral rich seawater revive and re-mineralize skin for a softer, smoother, and brighter natural glow. Skin is transported. NARS also describes this product as being non-comedogenic which means that it won’t block pores and cause acne. However, this moisturiser does have dimethicone as a primary ingredient which is a silicone which may lead to break outs if you have sensitive or acne prone skin. I wore this out today for a few hours and when I took off my makeup I had a new blemish. This could be hormonal or related to other reasons so I can’t definitively link it to the makeup. I have read reviews though where this product has apparently caused breakouts so I would suggest triailing it if you have sensitive skin. 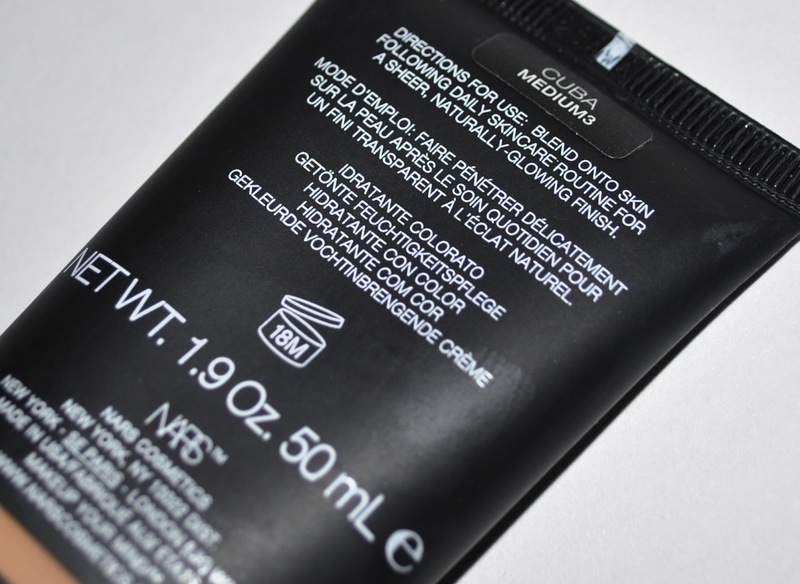 NARS also states that this product will help reduce hyperpigmentation after 4 weeks of use making it similar to a BB cream. I can’t and won’t be able to tell you whether this product helps as it says over time as I don’t use this every day. I would be interested to hear your experiences though if you want to leave me a comment below. As this product has 9 shades, hopefully you’ll be able to find a match in this range. I picked up the shade Cuba/Medium 3 which was the 3rd darkest from memory. The shade is a pretty good colour match if just slightly warmer than my natural skin tone. The product applies really easily on to the skin (probably because of all the silicone in it) and I use both fingers and brush to apply it with good results. 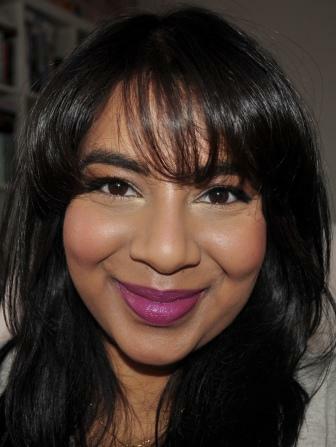 The finish is slightly dewy on the skin but doesn’t feel greasy. I find that my skin will get a bit oily after about 4 hours of wear. 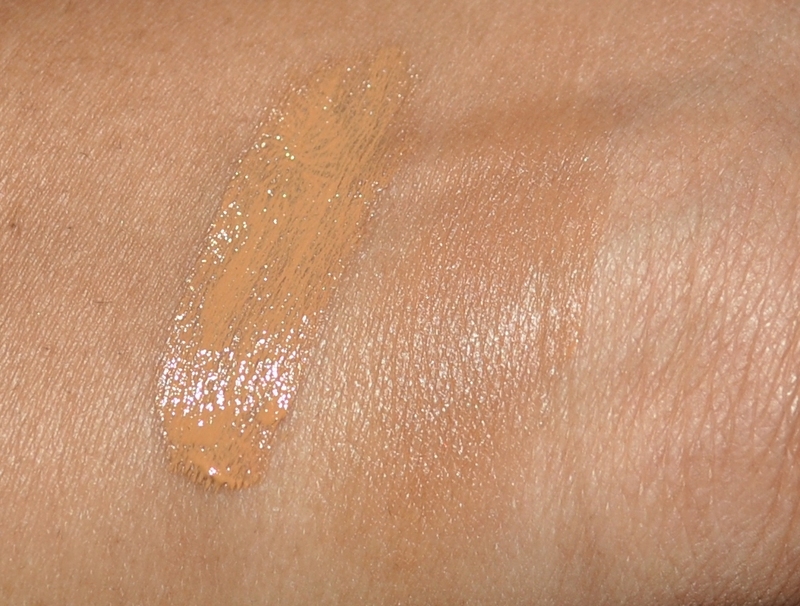 I’ve swatched the shade below and if you look at the blended out swatch, you should be able to see the very subtle shimmer running through the product which gives it the luminosity. Here’s a comparison swatch with some other products. 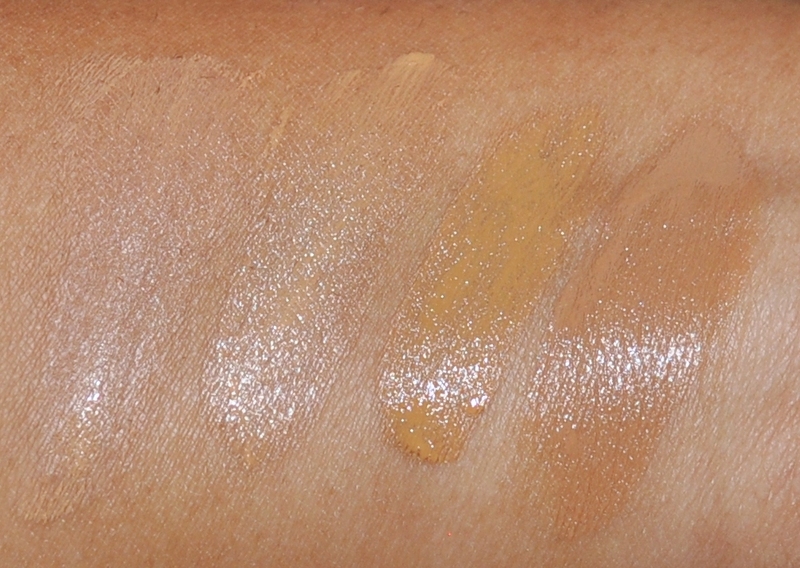 From left to right MAC Tinted Mosituriser in Dark, Becca Luminous Skin Colour in Bamboo, NARS Pure Radiant Tinted Moisturiser and MAC Face and Body in C6. 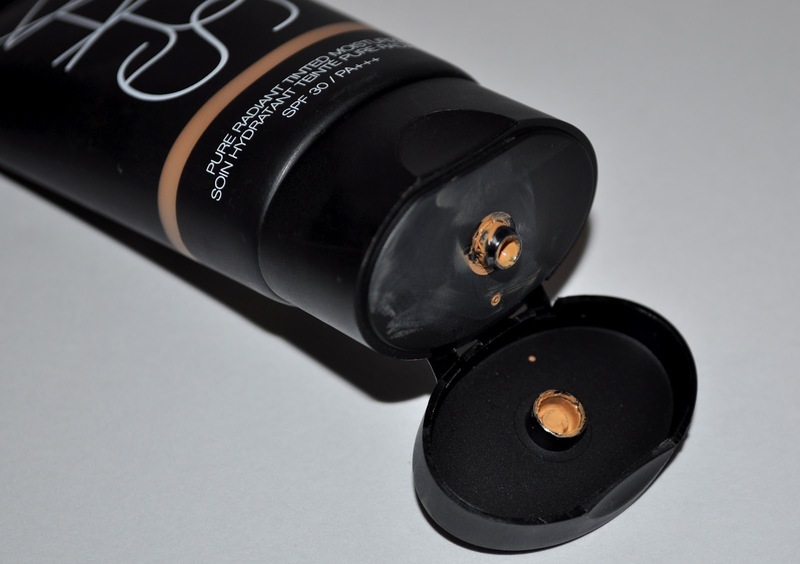 As with a lot of NARS foundations, this product has strong yellow undertones. Here’s a before and after shot to show you the coverage and finish. As a tinted moisturiser, this product is not meant to give any kind of meaningful coverage and it doesn’t. I know that should be obvious but I’ve read reviews of this product where people were disappointed at the lack of coverage. This product is only going to help even out uneven skin tone and add radiance to the skin and it does that well. 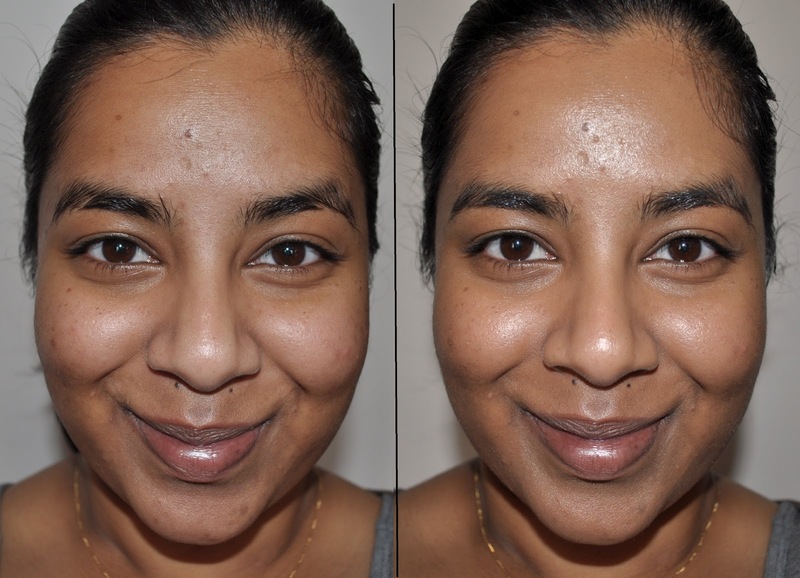 On the left is my face minus any makeup and on the right I have the NARS tinted moisturiser applied. As you can see, there isn’t a dramatic difference but it has evened out the uneven skin tone around the centre of my face and given some warmth and radiance to my skin. It doesn’t cover any of my hyperpigmentation though so I usually apply a bit of concealer to the darkest spots if I can be bothered. Most days though I just set it with my MAC Mineralize Skin Finish Natural and I get the perfect amount of coverage that I need. I really like this product and I think it’s something really easy to use on those days when you don’t want a lot coverage. The gorgeous sheen through the product is an added bonus and I think it’s perfect for bringing some life back to your skin in the colder months and perfect to keep a glow during the warmer months. I purchased mine while I was in Thailand but this product sells for $42US/$79AU and is due to release later this month in Australia. I love nars and I was super excited about the tinted moisturizer as I would finally have sheer tinted moisturizer and I knew I would get a perfect match. I love it I have seniuve skin and i haven't had any bad reactions to it. It is sheer but I only use this for days I literally have to run out the door. Georgio Armani face fabric is another great tinted moisturizer. Thanks Carissa 🙂 MAC Face and Body review is definitely coming up soon. I just haven't been happy with the before and after shots that I've taken the last few times that I've tried but I'm sure I'll get it right soon!